It took twenty four hours of flying time to get from SFO to Bali. The traffic congestion from the airport in Denpesar to my accommodation in Ubud was more akin to what I’ve seen in Kampala or the Bay Area than what I expected on an Indonesian island. 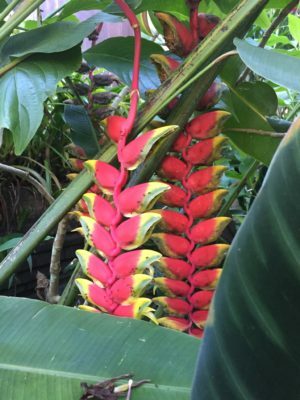 However, upon arrival at the small, family-operated hotel, I was joyful at the tranquility and beauty of this oasis with its elegance and charm. And the gardens! A riot of hot pinks, shades of lavender and purple, fiery orange, buttery yellow, bright white, deep green. 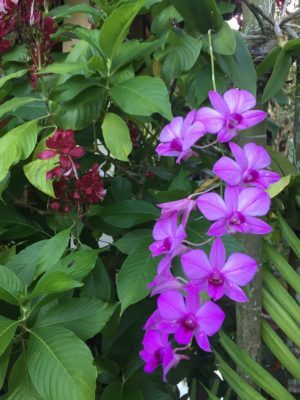 Bougainvillea, orchids, frangipani, bird of paradise. ornate painted doors. A place to unwind and slow down, the staff warm and welcoming. first went to the family compound of a local guide. 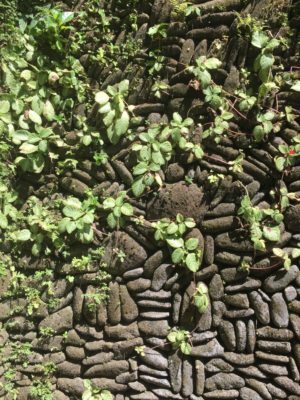 He introduced us to his mother who was preparing offerings to the gods from cut flowers she had purchased in the market at dawn as she did on a daily basis. (She was wearing a San Francisco Giants tee shirt!) We met his three year old son who was helping his grandmother prepare the offerings. accompanied by the guide, his brother, and his client, a scientist and photographer from Romania, living in Switzerland. Villagers and observers of all ages from near and far crowded onto the temple grounds. 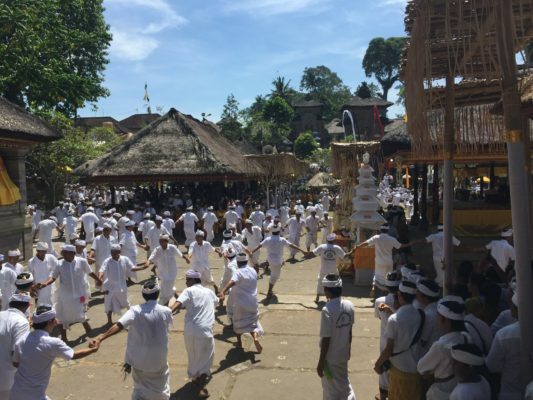 The ceremony featured processions of village women and men all clothed in white. 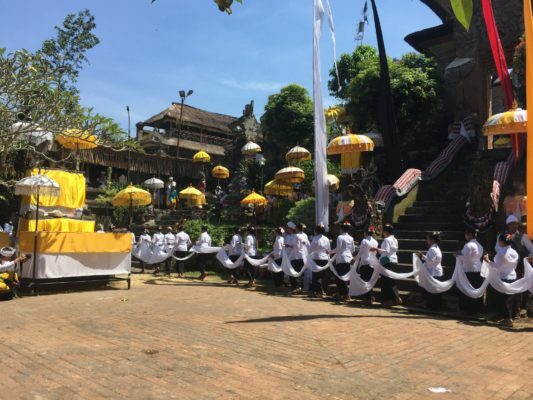 At first separately and then together, their long lines weaving slowly and then exuberantly to the gamelan music, they circled the temple again and again. 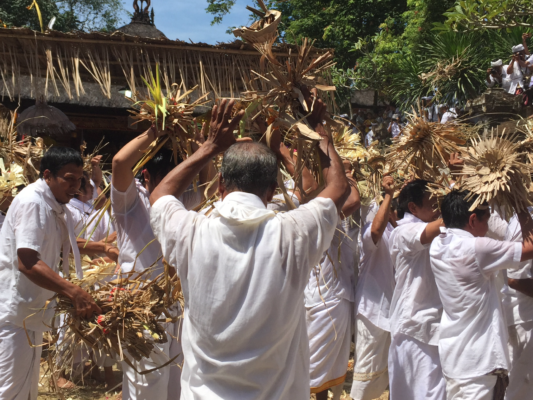 The ceremony finished with a “fight” called Siet-sampian that had the men throwing offerings made of coconut leaves at each other in mock battle in order to cast out evil while they laughed uproariously and hugged jubilantly. 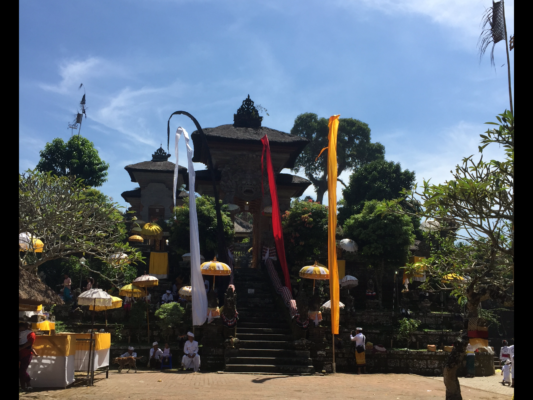 Afterwards, we returned to the guide’s house where we were joined by a cultural geography professor, born in Bali, living in San Francisco, and staying with the guide’s family. We talked for hours about culture and politics, a fascinating exchange of ideas and points of view. The afternoon concluded with a late lunch at their favorite restaurant where we ate delicious Indonesian food in the customary style without utensils but rather with our hands. Such an experience cannot be planned. 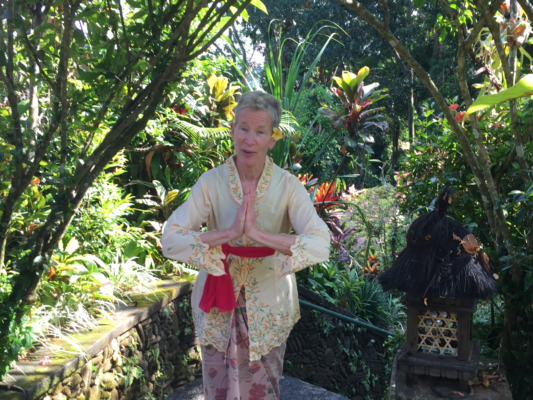 It occurred serendipitously and organically and was the highlight of my stay in Bali. Great post as always. My wife and I were there in 1995. Also stayed in Ubud at a place called Murni’s. Looking forward to more stories of your travels. Wonderful description of an extraordinary experience! Beautiful photos and commentary . What a wonderful day and love the photos! This sounds like such a wonderful trip. And inspirational as well as I think about where I will be traveling in the future. Thank you for sharing! What an awesome experience! Thanks for sharing and keep those postcards coming!